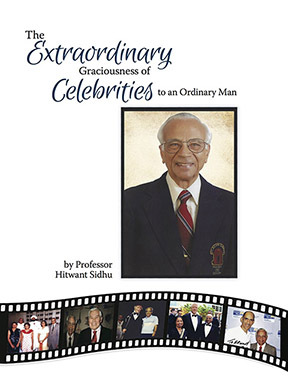 Professor Hitwant Sidhu has published The Extraordinary Graciousness of Celebrities to an Ordinary Man as a way to thank the dignitaries and celebrities for their graciousness in allowing him to come in contact with them. In 1952, while teaching in India, I had the honor of meeting Pandit Jawaharlal Nehru, India’s first prime minister, in connection with the celebration of his 63rd birthday at the National Stadium, India Gate, New Delhi. Meeting Prime Minister Nehru (and being photographed with him) was the most enjoyable experience of my life up to that time. It also gave me a good start for what has become a hobby ever since—having my photograph taken with celebrities in all walks of life. rough their graciousness, I have managed to be photographed with dozens and dozens of world-famous people from India and the United States. The list of these celebrities includes a former American president, three (former and present) presidents of India, government leaders in both countries—prime ministers, secretaries of state, senators, members of Congress, a U. S. Supreme Court justice, two U.S. generals, two astronauts, several motion picture, radio, and television stars from both countries, including some of America’s most prominent journalists and broadcasters, and, finally, more than a score of internationally known professional athletes from the Olympics, American baseball, football, and basketball players and coaches, as well as race car drivers, swimmers, golfers, and even a billiards champion. The proof of this statement follows in the form of several selections from my prized, perhaps unique, collection of photographs.